There are dozens of Palais or city palaces in Vienna - for a general introduction, please see my article on the "Palais of Vienna". One of the nicer Palais of Vienna is the Palais Cumberland, set aside from the main parts of the city in the 14th district of Penzing. Palais Cumberland looks like a 19th century pseudo-palace (which it mostly is), but at its core, there are three representative buildings that date back to the Baroque age. "Palais Cumberland" - or its oldest core - was originally built for Emanuel Teles Count of Sylva-Tarouca who came to the Imperial court in Vienna from his native city Lisbon in 1730. In Vienna, the count served as a statesmen and became popular with Empress Maria Theresia. In 1744, the purchased three properties in today′s district of Penzing, back then very rural and ideal for the construction of countryside-retreats. He had the three houses demolished and built a Rococo or early Classicist Palais. A few years later, Count of Sylva-Tarouca sold the Palais to Empress Maria Theresia, who gave it to her brother-in-law Prince Karl of Lorraine as a summer palace. This was done because Maria Theresia had a hunting chateaux right next to the property. Count of Sylva-Tarouca built another Palais right next to the one he had sold; later, this one was bought by local noblemen of Fünfhaus, the Pouthon family. They in turn sold it to Emperor Franz Josef I in 1867, who had the two palais that had been built under the supervision of Sylva-Tarouca combined into a single palace. Emperor Franz Josef I provided the palais for the exiled King Georg V of Hanover, who - not being king anymore - lived here under the title of "Duke of Cumberland". He used the Palais - now finally known as Palais Cumberland - as a representative building to live in, and made it the centre for his extensive and famous art collection. The Duke of Cumberland extended and refurbished the palace at several occasions. In 1908, the Palais Cumberland gained another wing, which combined the palace with the 18th century hunting châteaux of Maria Theresia. After the end of WWI, Palais Cumberland (the Duke of Cumberland had long died), became property of the Republic of Austria. 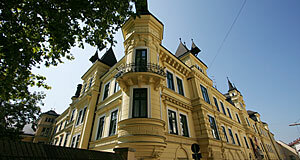 It was used as the embassy of Czechoslovakia, later the Reinhart Seminar - a famous Austrian drama school - moved in. Today, the outside of Palais Cumberland appears as if the building was a 19th century, historicist palace; this is mainly due to the façade, but extends to the main wing, which was actually built at this time. Very few parts of Palais Cumberland hint to the Baroque origins of the palace. Penzing is mostly a residential district, so there are few attractions nearby - do have a look at my general article on Penzing for further details.